GHRC supports Guatemalans’ right to truth, raises awareness about efforts to recover and preserve historic memory, and advocates for justice as an integral piece of reconciliation. Guatemala’s 36-year-long internal armed conflict ended with the signing of the UN-brokered Peace Accords in 1996. The Accords, which concluded five years of negotiations, placed limitations on Guatemala’s military in order to strengthen democracy and respond to the atrocities the military committed against its own people. In 1999, the UN Historical Clarification Commission concluded that 93% of the human rights violations committed during the internal armed conflict were carried out by the State. An earlier, unofficial truth commission sponsored by the Catholic Church also produced the Recovery of Historical Memory Project (REHMI) report, titled “Guatemala: Nunca Más,” which also discusses in detail the impacts of violence during the conflict. The right to truth, justice, and historic memory is universally recognized among survivor communities as being fundamental to authentic reconciliation and the restoration of dignity to victims and their families. Formally, the combination of judicial and political measures implemented to address the legacies of massive and systemic human rights abuses is called “transitional justice.” These measures include criminal prosecutions, truth commissions, reparations programs, and institutional reforms. Transitional justice seeks to adequately identify and address past human rights violations, and ensure that they never happen again. Unfortunately, the substantive work of the Guatemalan peace process remains unfinished and efforts to shed light on the Guatemala’s painful history have been continually obstructed. Very few cases have found justice through the courts, and the reparations process is mired in problems. During the Pérez Molina administration, the government aggressively undercut institutions such as the Peace Secretariat that were intended to support the people’s right to truth. In 2005, millions of National Police files were discovered by chance in an abandoned warehouse in Guatemala City. These documents, which detail the history of the National Police as well as its role in the armed conflict, were archived and have been used in court cases regarding the disappeared. Although groups of survivors reported the existence of clandestine graves in their communities, no systematic effort has been made by state authorities to recover the remains of the tens of thousands of victims who remain buried in mass graves. Hundreds of exhumations have been conducted by the Guatemalan Forensic Anthropology Foundation (FAFG), and the foundation has created a DNA bank to attempt to match the remains of the dead with their living family members. Many of the bodies exhumed from mass graves in rural communities are members of those same communities. However, exhumations on military bases have uncovered the remains of people from across the country, some of them who had been “disappeared” by the government during the war. Overall, an estimated 45,000 people were forcibly disappeared during the conflict. In the early 1980s, family members of the disappeared began to organize, calling on the Guatemalan government to locate their loved ones. The organizations The Association of Relatives of the Disappeared and Detained of Guatemala (FAMDEGUA) and the Mutual Support Group (GAM) grew out of these movements and sustained them over decades (In the above video, Marcia and Blanca, founding members of FAMDEGUA, share their story). In 1999, a leaked government logbook called the Military Dossier or “Diario Militar” revealed details about the kidnapping, torture, and extra-judicial killing of 183 Guatemalans who were considered “subversives” between 1983 and 1985. The case was taken to the Inter-American Court of Human Rights, which ruled in 2012 that the State was responsible for the forced disappearances and must conduct a full investigation and prosecute those responsible. A companion case has been brought in Guatemalan courts. Guatemalans have also sought long-promoted legislation requiring a systematic search for the disappeared, Bill 3590, but it has not yet been passed by the Congress. A National Reparations Program was begun in Guatemala in 2005, nearly 10 years after the Peace Accords were signed. Although the program contains both material and symbolic reparations, in practice it has been largely focused on providing small payments ($3,000 per victim) to a handful of families. The process has become mired in bureaucratic difficulties and has excluded large numbers of women survivors. Historically, there has been almost total impunity for crimes committed during the armed conflict. A number of cases were taken to the Inter-American Court and in August 2014, the Court ruled that Guatemala was “in contempt” for failing to implement 11 sentences. Nevertheless, in recent years a number of emblematic cases have moved forward. In Guatemala, as in many countries, women have played an integral role in transitional justice processes, both in their communities as well as on a national level. In, 2014-15, GHRC helped coordinate a series of three workshops that brought women together from across Guatemala who had been involved, in different ways, in these processes. The workshops focused on the real-life experiences of the participants and explored the topic of justice in the most profound sense of the word. During the first workshop some of the women spoke specifically about the transition from staying silent to speaking up about their search for justice. 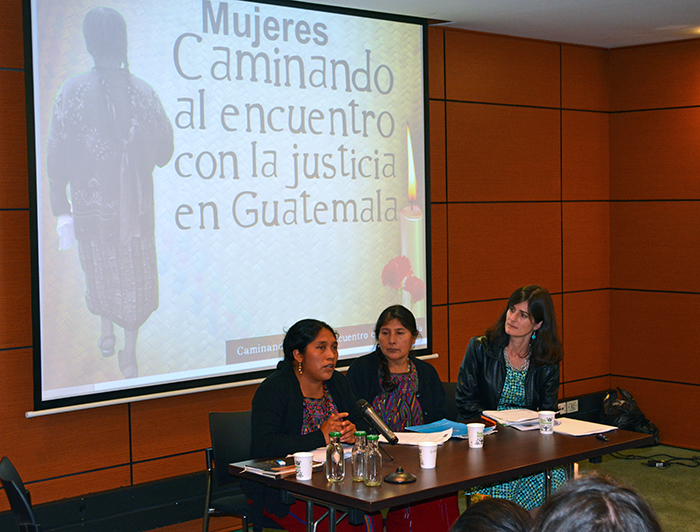 The three workshops also created opportunities in both Guatemala and Colombia for women to share their experiences with transitional justice processes and how they are organizing to create change at the local level. View photos from the last workshop, carried out in February 2015, here. THE GENOCIDE CASE: Ríos Montt and other high level military officials are facing trial on charges of genocide and crimes against humanity. BÁMACA CASE: Everardo Bámaca was a leader with the revolutionary group ORPA. He was kidnapped, held in secret torture chambers, and then assassinated by the military. DOS ERRES CASE: In December 1982, during the de facto administration of Ríos Montt, approximately 300 residents of Dos Erres, Libertad, Petén were murdered by the Guatemalan military’s special forces, the Kaibiles. Intense work by the organization FAMDEGUA led the Dos Erres mass grave to be one of the first to be exhumed in the 1990s. BURNING OF THE SPANISH EMBASSY: The 1980 burning of the Spanish Embassy in Guatemala was an assault by Guatemalan security forces that left 37 dead. After a decades-long search for justice, Pedro García Arredondo was found guilty on January 19, 2015 of orchestrating the massacre. He was sentenced to a total of 90 years in prison. Updates related to justice as well as pertaining to the Ríos Montt genocide case are available on the GHRC blog.